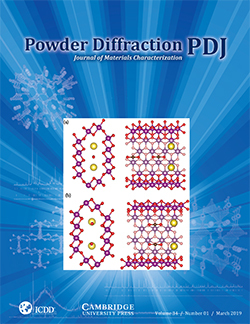 Powder Diffraction is a quarterly journal published by the JCPDS-International Centre for Diffraction Data through the Cambridge University Press. The journal focuses on practical technique, publishing articles relating to the widest range of application—from materials analysis to epitaxial growth of thin films and to the latest advances in software. Although practice is emphasized, theory is not neglected, especially as its discussion relates to better understanding of technique. Cambridge University Press publishes over 280 peer-reviewed academic journals in a wide variety of subject areas. They have over 50 offices across the globe and publish over 40,000 titles by authors from over 100 countries. Abstracts, Editorials, and International Reports from Powder Diffraction Journal are available online free of charge at Cambridge Core. A subscription is necessary for more data. Authors, subjects and page numbers are listed in the Past Issue Pages. Do you have an interesting diffraction related topic for Powder Diffraction Journal? Got an interesting compound or diffraction technique you are working on? This issue contains the first of a Special Section of papers related to the crystallography, structure and properties of Metal Organic Framework (MOF) materials. This issue’s cover is from the technical article by Matthew Lawson et al. It shows the atomic structure of the porous MnO2 Octahedral Molecular Sieve, OMS-5. The figure shows the tunnels containing the CO2 molecules (O in red, C in black, Mn in purple and Na in gold) in two orientations: (a) head-to-head and (b) stacked. The formation energy for the head-to-head orientation was determined to be smaller than that for the stacked orientation indicating that the CO2 molecules in OMS-5 prefer to align head-to-head in the tunnel. ICDD’s international journal, Powder Diffraction, published quarterly plus an annual special topical issue, in collaboration with the Denver X-ray Conference Organizing Committee, has increased services for the subscribers of Powder Diffraction and authors of Advances in X-ray Analysis (AXA). Beginning in 2006, ICDD offered access to of the previous year’s edition of AXA to Powder Diffraction institutional print/online subscribers. This effectively doubles the number of articles annually available to Powder Diffraction subscribers and significantly increases the circulation for the authors in Advances in X-ray Analysis. Subscription rates to Eastern Hemisphere include airfreight service. Note: Form must be signed or manuscript will not be published. Powder Diffraction is presently available online at Cambridge Core. Since initial implementation there has been a steady increase in online subscription readership. This has occurred because of the participation of Powder Diffraction in a number of large publishing consortia. By contract, these consortia provide access to a large number of users solely by online access. The web site is also visited thousands of times per month by non-subscribers who view the contents and abstracts. Cambridge University Press offers several online slots for banners in addition to print ads. Oak Ridge, TN 37380 U.S.A.
Newtown Square, PA 19073-3273, U.S.A.
James Kaduk, Poly Crystallography Inc. Document Delivery and Online availability: Abstracts and articles of Powder Diffraction are currently available at Cambridge Core . PDF copies of articles can be ordered online from the Contents or Abstract view. Permission for Other Use: Permission is granted to quote from the journal with the customary acknowledgment of the source. To reprint a figure, table, or other excerpt requires the consent of one of the authors and notification to Cambridge University Press.